Put your little one to sleep with this soothing aquarium. It calms Baby with softly glowing light and bubbling motion. Plays 2 lullabies or water sounds, including ocean waves, falling raindrops and more. Plays for approximately 7 minutes. Attach to crib rail or set on dresser top. Requires 4 D batteries (not included). Colors and decorations may vary. Imported. I received this product as a gift when my son was a few months old. After having it in storage for a couple of years I took it out this morning to put it up for my daughter and there's barely any water left. I called the consumer number on the back and I was told that yes, sometimes the water evaporates but no one knows where it goes. I was told it was a mystery. And there's no way to replace it. I expected a little something other than an "I'm sorry" from the very nice woman I spoke with, but no. We liked it very much for my son and would have given it a four star rating, but based on the fact that it does not survive the test of time, I give it only one star. My neice and nephew loved this toy and so when we had a baby it was the first thing we wanted! Our son LOVES it. We like the original version...the newer one isn't as cute and we like the music from the original one too. I cannot say anything negative about this toy! A must have! We bought this item about a week a go. It was easy to install and absoulutely beautiful to look at and listen to. My husband and I decided on this aquarium instead of a traditional mobile because traditional mobiles will have to come out of the crib by the time our son is able to pull up/stand in his crib. 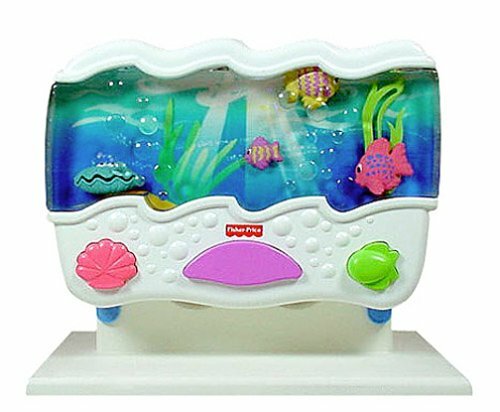 I would recommend this Fisher Price Ocean Wonders Aquarium to other parents. My Baby Boy Loves It!!! I'm almost speechless about how great this aquarium is. I got it for a shower gift and my daughter is almost 2 now and we still use it every night. I take it with us when we go out of town for over night trips as well. She can now turn it on and off on her own now which is a great help during the night, puts her right back to sleep. This was a baby shower gift for my baby girl. And I did not really know if I would ever use it since I already had a mobile. But my baby seems to enjoy this aquarium better than the mobile when she turned 5 months. It really keeps her in good mood when she should fall asleep. With the light you still see the baby in a perfect dark room. And now, with baby turning 8 months, she is able to hit the on and off button herself with either hand or feet. This toy really keeps her occupied! We received this toy as a gift when our son was six months old (he's almost 2 now). He quickly learned to use it, and it was much better than the mobile, because he could turn it on himself at any time. We have used link-a-doo's to connect it to a pack-n-play when traveling. Since he is now in a twin bed, I have again used link-a-doo's to connect it to the headboard, and he still loves it. I think that we've only changed the batteries twice in a year and a half--wonderful!! Both my kids love it. Fabulous toy for the crib. My baby loved and still does love this toy. Fantastic settings for adults (volume control, music choice, lights or no lights, bubbles or no bubbles). Great soothing music to settle down to at night. Fun to play with when they wake up. It is very easy for a young baby to push the button to turn it on. Would never go without one!!!! Finally, a full nights sleep! I had this set up in my daughter's crib when she was a baby. It would light up the room just enough for her to feel comfortable but not so much that it kept her awake. The music is very soothing and not as cartoony as you would think. The unit would turn itself off after a period of time so I wouldn't have to creep back into the room hoping not to wake her. We received this acquarium at a baby shower. At first I was concerned it was going to be too TV-like. However, it's very interactive and is appropriate for a broad range of developmental levels. My daughter is 8 months old and still enjoys pulling the lever and spinning the ball. Great but it shuts off way to soon! Maybe he loves it too much!? Our son is eleven months old and this is by far one of his favorite toys - and has been since he was just a couple months old. We can always tell when he's awake after a nap - he turns it on immediately! It's very soothing and I like that you can choose from several music or nature sound selections. But it also keeps him entertained when he's not sleepy!